For the third year in a row, a student from Veterans Memorial High School has earned a spot in a Texas Music Educators Association (TMEA) All-State Choir. This year, Cherish Varlack earned that honor after her performance at the last round of auditions. The four-stage audition process began in September 2012 with several thousand students auditioning across the state. The Final Area G auditions were held earlier this month at Rockport-Fulton High School. Varlack placed fourth chair in the TMEA All-State Mixed Choir. Only the top ten female students and top eight males, per voice section, qualify for the All-State Choir. 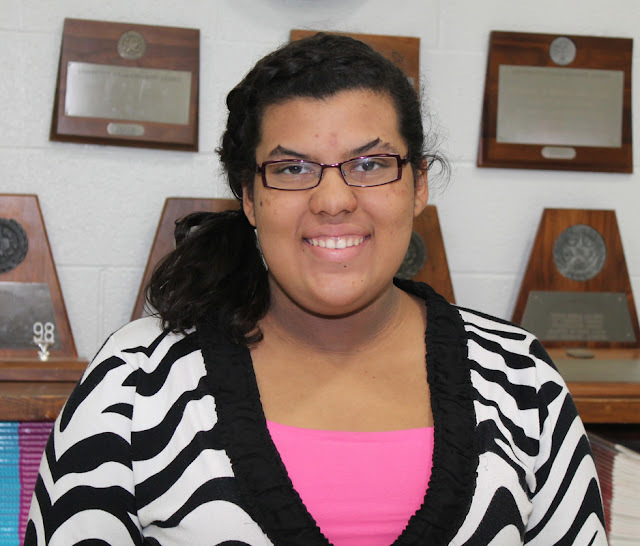 Varlack will participate in the TMEA All-State Choir clinics and concerts as an alto. The events will be held in San Antonio in mid-February. The concerts are traditionally attended by as many as 3,000 spectators. Soprano, Kivani Sanchez just missed out on the All-State choir, however she is a first alternate. This means she is on standby to officially qualify for the All-State choir should someone above her not be able to fulfill their obligation. Tenor, Demetrius Davis also advanced as high as the area finals in Rockport, but did not qualify for the All-State choir.